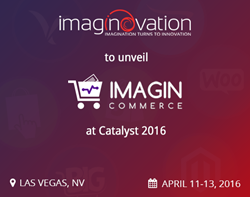 Imaginovation, a web development and digital marketing firm, will launch ImaginCommerce at Catalyst 2016. The platform enables e-commerce agencies to view data from multiple e-commerce APIs all in one place. ImaginCommerce is an intuitive platform that enables agencies to view, analyze and generate reports for clients with multiple e-commerce APIs from a central location. Imaginovation LLC, a web development and digital marketing firm located in Raleigh, NC, will attend the industry-leading e-commerce event Catalyst 2016 as a Gold Sponsor. The event will be held in Las Vegas, NV from April 11-13, 2016. Prominent retailers in the field of e-commerce are expected to attend. Imaginovation is one of the Gold Sponsors of the event, alongside Cloud Conversion, Newegg, and Yahoo! The company will unveil its newest offering, ImaginCommerce, at Catalyst 2016. It’s an intuitive platform that enables agencies to view, analyze and generate reports for clients with multiple e-commerce APIs from a central location. Catalyst is an annual e-commerce event that brings together established and upcoming market players to share insights and learn about emerging industry trends. Founded in 2011 by Pete Peranzo and Michael Georgiou, Imaginovation started as a Web services provider that has since grown to be a full-fledged agency that offers a wide range of services from web design and development to digital marketing solutions. The company keeps up with the latest trends in Web and mobile technology to give clients their best ROI in a rapidly changing business environment.